UPDATE: January 28 Russell Crowe just posted his own Youtube video recording of him singing STARS to musical accompaniment. Listen to the version Russell just posted and compare it to the version that appeared in the movie below. I know what some people (Adam Lambert) are saying about the singing in Les Miserables. Which is why I've chosen to highlight Russell Crowe singing Stars from the movie soundtrack. I love this song so much; I can't get it out of my head. I bought the soundtrack on iTunes and put together the track from Stars with some film stills I downloaded from google - obviously I don't own the rights. "Pretending"?!! Russell Crowe couldn't resist responding. "I don't disagree with Adam, sure it could have been sweetened,” tweeted Crowe. “[Director] Tom Hooper wanted it raw and real, that's how it is." Naturally Lambert had to respond back. “U can spend a whole year praising artists for inspiring work, but one critique gets all the attention. Funny, those raw and real moments when characters broke down or were expressing the ugliness of the human condition were superb. However... My personal opinion: there were times when the vocals weren't able to convey the power, beauty and grace that the score ALSO calls for." 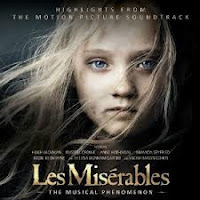 How do you feel about the music of Les Miserables? I'm no singer - actually I can't sing at all - so maybe I'm less critical about perfect singing but for me the music is masterful and moving. period. which only means that i can sort the great from the good from the bad. I happen to think that Russell Crowe played to his strengths quite finely in this film. And though he relied on recitative more than the others, he did more with less, if you know what I mean. His voice? Not strong. Not great. But good enough to carry what needed carrying, and he never gave the impression that he was straining in any way. Unlike Jackman, whom I adore, but whose voice made my throat hurt by the end of the movie it sounded so strained. Yes! I think in show biz terms they would say he 'sold' his songs and despite displaying any great range, reached the heights and delivered his message. I think Hugh did too but if I look deep into my heart I might have to agree about his voice. I didn't feel it the first time I saw the movie - we were all so blown away but when I saw it again, while I loved the movie even more I noticed different things about it, one of which was that Hugh's register seemed a little high, his voice a little ravaged. Which I find a odd considering he has a reputation for nailing the B'way stuff. Of course, he knocked it out of the park with Anne Hathaway at last year's Oscars. It's also notable since Hooper is adamant he would never have done the film without Jackman. I guess his primary concern really was the song's dramatic essence as dialogue over the musical execution. That must be harder for people with more discerning ears, like you! I agree with you. I loved "Les Miz" and have also been haunted by Russell Crowe's "Stars"! It was very moving, as was his Javert. I've seen it twice now, and loved it as much the second time as the first. Thanks for posting the song! I'll be buying it, as well! Don't you love the shot of the toes of his black boots on the wall above the water? So ominous. I still haven't seen this movie! Maybe this weekend, it's actually on here now. As you know I am working through the unabridged version of Les Miserables (translated) and would like to wait to see the movie when I have finished. I have seen Les Miz in London (1987), New York, and once on a traveling production, know most of the words. I have watched twice the O2 production of the 25th anniversary performance (YouTube). So, I am definitely a fan of M. Hugo and Cameron MacIntosh. I listen to my CDs in the car when I travel alone by car until the music makes me cry (always). I think that each medium will contribute to my love of this story: the unabridged book, the original London cast CD, Susan Boyle's performance, the 25th anniversary recorded performance, and finally the movie. If the voices do not overwhelm with their purity, the "live" method and the passionate acting will make it a winner for me. It will be the combined remembrances of all the mediums that puts this remarkable story at the top of my list. Genie, I've been listening to the music from the movie when I do my morning powerwalk ... trying not to cry or sing right out loud LOL. It affects me every time too. I'm so curious to know if there is any kind of romance between Valjean and Fantine in Hugo's novel. I've heard rumblings there was a hinted relationship; is it so? No romance but he feels responsible for her misery since the "floor manager" for his business threw her out into the street. Her early death comes as a direct result of her inability to pay her debts, including the increasing amounts demanded by the Thenardieres for Cosette. Fantine sells her hair and her front teeth and then turns to the street. Valjean rescues her at the last moment before she is sent to prison and she is in terrible health. They let her keep her teeth in the film but otherwise it's much the same. I'd heard somewhere there might have been an inkling of a romance.